The OLT manages ONTs and applies VoIP configurations to the ONT using the OMCI protocol. This topic describes how to configure the H.248-based voice service. The interface data and POTS user configuration data corresponding to the MG interface have been configured on the MGC. The OLT has been connected to the MGC. The OLT can ping the IP address of the MGC server successfully. The ONT has been added to the OLT. For details, see Adding an ONT to an OLT. Different voice services require different ONT software versions. Before the configuration, ensure that the current ONT software version supports H.248. For details, see relevant ONT manuals. Run the display traffic table ip command to query the existing traffic profiles in the system. If the existing traffic profiles in the system do not meet the requirements, run the traffic table ip command to add a traffic profile. Set the profile name to ftth_voip and do not limit the upstream and downstream rates. Set the priority to 5 and packets are scheduled according to the priority carried. 2. Configure the mapping relationship between a GEM port and a VLAN. The service flow of user VLAN 40 is mapped to GEM port 12 in the ONT line profile. 3.Create a service VLAN and add an upstream port to it. Add upstream port 0/19/0 to VLAN 40. Set the service VLAN to 40, GEM port ID to 12, and user VLAN to 40, and use traffic profile ftth_voip. 5.Enable the ARP proxy function. Voice media streams for different users of the same SVLAN fail to interchange because the service ports of the smart VLAN are isolated from each other. Therefore, the ARP proxy function needs to be enabled on the OLT. ONT H.248-based Voice Service configurations include the VoIP service provisioning mode, ONT voice profiles, voice users, and voice-related parameters. ONT voice profiles include the common MG interface attribute profile, POTS port profile, MGC profile, and voice signal profile. Common MG interface attribute profile: saves common attributes of an ONT voice interface, including the fax mode, fax/modem negotiation mode, and priority of the coding and decoding mode. POTS port profile: saves physical attributes of a POTS port on an ONT, including the impedance, Tx gain, Rx gain, and signaling type of a POTS port. MGC profile: saves the IP address or domain name of an MGC, protocol port ID of the MGC transport layer to which the MG interface belongs, and DSCP priority of media packets. Voice signal profile: saves the ONT signal tone and ringing tone. Currently, the common MG interface attribute profile, POTS port profile, and MGC profile can be applied to an H.248 interface, and the voice signal profile can be bound to an H.248 interface. For profiles that can be applied to an H.248 interface, if parameters in those profiles are changed, those profiles must be reapplied to the H.248 interface so that the changed parameters can take effect. For profiles that can be bound to an H.248 interface, if parameters in those profiles are changed, those profiles do not need to be rebound to the H.248 interface and the changed parameters can take effect. a. Configure the VoIP service provisioning mode.Run the ont voip config-method command to configure the VoIP service provisioning mode. Run the display ont info command to query the mode of issuing VoIP services.In this example, the mode is default, that is, the VoIP service provisioning mode is depended on the actual service provisioning mode on the ONT. Run this command to select a proper mode if the system supports multiple voice service provisioning modes. The service provisioning modes can be OMCI, FTP, and TR069. b. Configure and apply an MG interface public attribute profile.In this example, the default profile 1 is used. 1. Configure an MG interface public attribute profile.Run the display ont-mg-attribute-profile command to query the existing profile in the system. If the existing profile in the system does not meet the requirements, run the ont-mg-attribute-profile add command to add a profile. 2. Apply a common MG interface attribute profile.Run the ont-if-h248 bat-apply command to apply profiles in batches to H.248 interfaces and run the if-h248 attribute command to apply a profile to an H.248 interface or configure customized parameters on an H.248 interface. If you run these two commands to apply profiles in batches or configure customized parameters repeatedly, the last configurations take effect. c. Configure and apply a POTS port profile.In this example, the default profile 1 is used. 1. Configure a POTS port profile.Run the display ont-pots-profile command to query the existing profile in the system. If the existing profile in the system does not meet the requirements, run the ont-pots-profile add command to add a profile. 2. Apply a POTS port profile.Run the ont-pstnport electric bat-apply command to apply POTS port profiles in batches and run the pstnport electric command to apply a POTS port profile to an H.248 interface or configure customized parameters on an H.248 interface. If you run these two commands to apply profiles in batches or configure customized parameters repeatedly, the last configurations take effect. 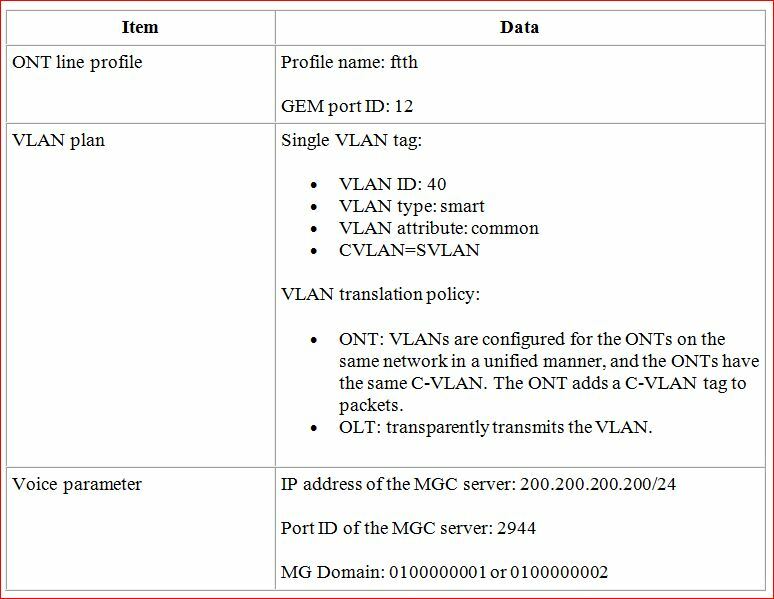 d. Configure the voice WAN port of the ONT.For ONT configure the IP address obtaining mode to DHCP, set the management VLAN to VLAN 40, and use default values for other parameters. e. Configure and apply an MGC profile. 1. Configure and apply an MGC profile.Run the display ont-mgc-profile command to query the existing profile in the system. If the existing profile in the system does not meet the requirements, run the ont-mgc-profile add command to add a profile. Create MGC profile 2, set the IP address of the MGC to 200.200.200.200, and use default values for other parameters. 2. Add an H.248 interface and apply an MGC profile to the interface. For ONT set the MG ID to 1, apply MGC profile 2 to ONT and use default values for other parameters. For ONT create a POTS user, set the MG ID to 1 (identical to the MG ID of the H.248 interface), and set the physical terminal port ID to A0. Run the display mgpstnuser attribute command to check whether the configuration of the POTS user is properly set. …//The rest of the response information is omitted. g. Configure and bind the voice signal profile. In this example, the default profile 1 is used. 1.Configure the voice signal profile. Run the display ont-voipsignal-profile command to query the existing profiles in the system. If the existing profile in the system does not meet the requirement, run the ont-voipsignal-profile command to add a profile. 2. Configure the ONT signal tone. Run the display ont-tone command to query the existing configuration in the system. If the existing configuration in the system does not meet the requirement, run the ont-tone add command to add signal tone parameters. The ONT signal tone will not be configured independently in this example. 3. Configure ONT ringing parameters. Run the display ont-ring command to query the existing configuration in the system. If the existing configuration in the system does not meet the requirement, run the ont-ring add command to add ringing parameters. The ONT ringing parameter will not be configured independently in this example. 4. Run the commit command to save parameters of the voice signal profile to the database. 5. Bind the voice signal profile. Run the ont-voipsignal bat-bind command to bind voice signal profiles in batches or run the voipsignal command to bind a voice signal profile to an ONT. If you run these two commands to bind profiles in batches or bind a voice signal profile to an ONT repeatedly, the last configurations take effect. h. (Optional) Configure the H.248 user codec. Run the mgpstnuser codec command to configure the H.248 user codec. The H.248 user codec will not be configured independently in this example. i. (Optional) Configure the global VoIP media attributes of the ONT. Run the ont-voip-media attribute command to configure the global VoIP media attributes of the ONT. Before configuration, ensure that the configured media attributes are supported by the corresponding ONT. Otherwise, the ONT configuration will fail. The global VoIP media attributes of the ONT will not be configured independently in this example.